This Hawaiian long lei is strung with colorful rose bud with ferns, Hawaiian lei is symbolize for greeting 'ALOHA" and "Love". 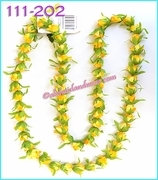 Hawaiian lei can be worn for Hawaiian tradition wedding, graduation, birthday, retirement or giving away as a gift to someone special, the long lei is most use for Hula dancers. Lei is made on 100% silk flowers, durable and reusable.